Staircases have a big impact on defining the aesthetic look of your home. Floating staircases are one of the more stylish staircases in the market that enhance a home’s interior design. A lack of structure beneath each step creates the illusion of floating treads. This floating illusion is further enhanced by other stair features such as glass balustrades and minimalist treads. Floating staircases come in a variety of styles. Designs range from simple timber treads with glass balustrades to sophisticated steel treads with elaborate handrails. Selecting the right floating stairs depends on the style of your home interior, the available space and if your wall is able to support the weight of the stairs. Some of the staircase’s weight can be spread through the stringers. For example, some floating stairs are supported by a single welded steel spine that runs underneath the treads and attaches to the existing wall. To further share the load of the treads, you can add a second stringer on the other side of the treads. The extra bracing strengthens the structure and transfers some of the load to the floor. To know if your home’s wall is able to support floating treads, or if the floor is able to support the extra load, contact our floating stair specialists. Some floating stair designs include landings ‒ sections of flooring between turns of a staircase. Landings do not only enhance style, but are a safety feature. They provide space to rest if carrying heavy items and reduce the length of a fall if someone trips down the stairs. If you live with pets, children or elderly people, consider adding a landing to minimise the risk of serious injury. To further enhance safety include proper balustrades and hand railings. 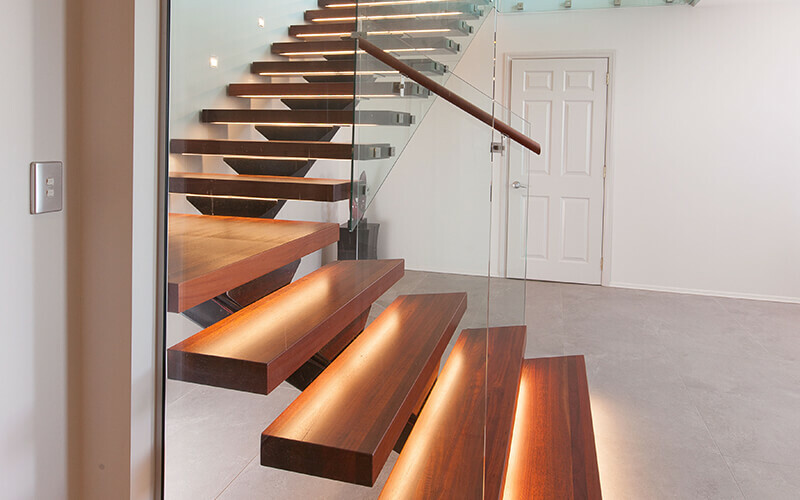 The most popular and contemporary materials used for constructing floating staircases are glass, timber and stainless steel. For a modern look, you can use glass balustrades to give a more spacious look by allowing more light around the stairwell. For a more traditional look, consider using solid timber treads. The treads are available in a variety of timbers to match the colour of the existing floor timber; a stainless steel handrail gives a subtle appearance that complements most interior décor. At Ackworth House, we offer you the complete staircase solution. We offer various handrails and balustrades that complement our floating staircases. Our Ascendo stair series features a choice of six floating staircase designs. Each design has its own distinctive functionality and aesthetic quality. If you want a robust emphasis on your staircase, you can select our Dualis floating stairs. It features broad treads and dual welded spines underneath to give a sturdy look. They are available in various types of timber and other materials such as granite. We provide floating stairs construction in Auckland, Whangarei and other cities in New Zealand. For any inquiries about our Ascendo floating stairs, call 0800 225 967.